I thought it would be beneficial to use my blog post as a follow up on the stand with standing rock presentation I gave yesterday in order to show everyone the videos associated with the movement and more examples of social media posts. As I mentioned during my presentation, the Standing Rock Sioux tribe believes the construction of the Dakota Access Pipeline will “destroy their burial sites, prayer sites, and culturally significant artifacts”. Additionally, the tribe is alarmed by the pipeline crossing directly under their reservation’s main source of drinking water-the Missouri River. In the event the pipeline burst or an oil spill occurred, the water supply for the reservation would be permanently contaminated. The Sioux tribe subsequently filed a lawsuit against the US Army Corps of Engineers in July of 2016 hoping that the court would deem the Corps’ permit to build the pipeline invalid. Within days, the Dakota Access parent company, Energy Transfer Partners, countersued the chairman of the Sioux tribe claiming they were attempting to block construction of the project. This led to protests that initially began at the Standing Rock Reservation in North Dakota but spread across the country and even the world via various social media platforms. Change.org is a website that allows any individual who signs up to create their own petition and circle it on the web in order to get others involved. They describe themselves as the “world’s platform for change” and boast having a total of 181 million people taking action on the site. The youth of the Sioux tribe utilized this website to create their own online petition to halt the construction of the pipeline. In order to gain signatures they promoted the link on Twitter and included a YouTube video campaign in their petition description. During this video, the young Native Americans introduce themselves and discuss the affect the pipeline would have on the Missouri River and their lives on the reservation. Their efforts resulted in 556,283 signatures on the petition which they then sent to US Army Corp of Engineers. Shailene Woodley’s actions on Facebook in relation to the pipeline protests resulted in viral posts that increased awareness around the world. The high profile actress was one of the protestors at the front lines at the Standing Rock reservation and was amongst 27 activists who were arrested during October 2016 for allegedly trespassing. As I mentioned, she instructed her mother to post footage of her arrest on Facebook Live. This post received 4.9 Million Views; 88,400 shares, and 61,000 comments. Her mug shot from the arrest (shown below) also proceeded to go viral. 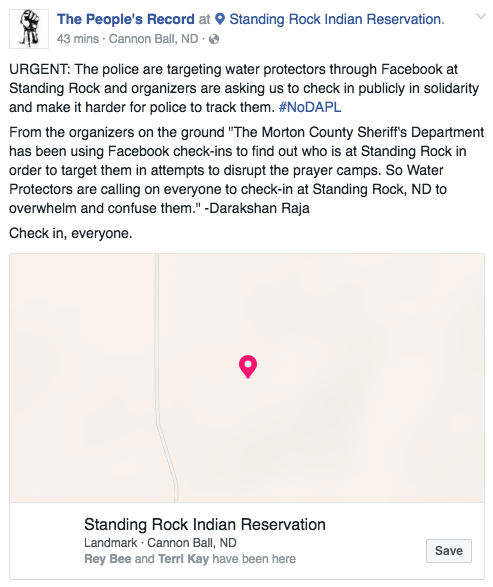 “The Morton County Sheriff’s Department has been using Facebook check-ins to find out who is at Standing Rock in order to target them in attempts to disrupt the prayer camps. SO Water Protectors are calling on EVERYONE to check-in at Standing Rock, ND to overwhelm and confuse them. This is concrete action that can protect people putting their bodies and well-beings on the line that we can do without leaving our homes. Will you join me in Standing Rock? 2) Make the clarification post SEPARATE, and limit post visibility to your friends only. 3) Don’t clarify on your check-in post; privately message friends who say “stay safe!” to let them know what’s up. 4) Copy/paste to share clarification messages (like this one) because making it public blows our cover. A collective initiative to stand in solidarity with those at standing rock occurred on November 15, 2016 via the use of a Twitter hashtag. 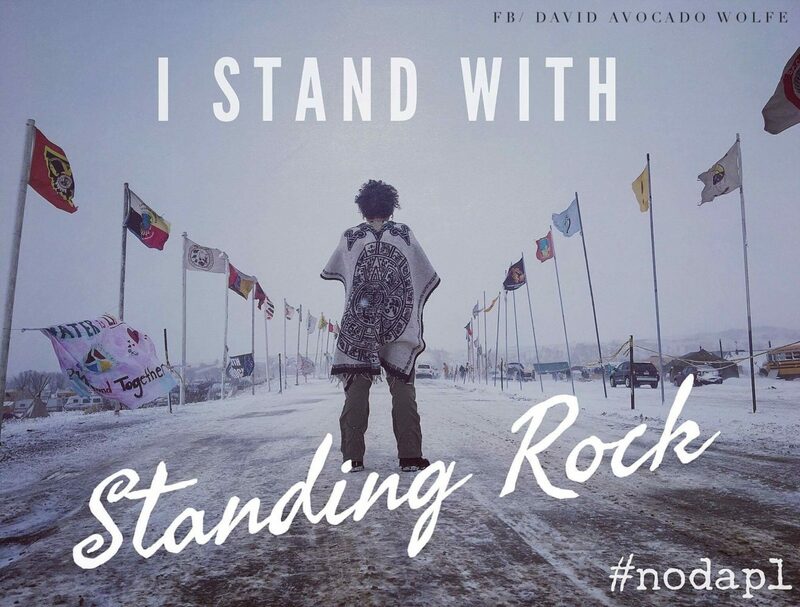 This hashtag had an immensely powerful effect by spreading the protests from taking place on this one reservation in North Dakota to taking place in 300 cities around the world. Here you can see video I mentioned during my presentation of individuals standing in solidarity with standing rock in front of city hall in San Francisco. I hope that this blog post allowed those interested to see firsthand the footage and posts I described during my presentation! I believe seeing the powerful nature of these makes it a lot more apparent why this social media movement received the amount of attention it did, both online and in the news. Great post and great presentation! It’s super interesting to see the Standing Rock advocates get their voices out through social media. I think this is an incredible change in our technologically inclined society because it gives a voice to people and causes who might otherwise not have one. I also think the involvement from celebrities likely wouldn’t happen without the social media channel, or at least it wouldn’t be as pronounced. Thank you for sharing this with the class! Really great followup to a solid presentation.